Solar Photovoltaic Systems improve your life! Your Position: > Knowledge >> solar system >>> Solar Photovoltaic Systems improve your life! Solar photovoltaic system is a method to generate solar energy into electricity. The solar photovoltaic system uses solar panels made of silicon to convert sunlight into electricity. The system consists of multiple components. PV modules (groups of PV cells) commonly known as PV panels; batteries; a charge regulator; an inverter for a utility-grid-connected system; mounting hardware. 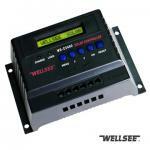 The charge controller acts as a voltage regulator preventing overcharging of the storage batteries. A photovoltaic control can automatically sense when the batteries are fully charged or are close to being depleted and reduce additional energy to the batteries or prevent further current discharge accordingly. With the use of enough solar panels and high rate of sunlight, a large solar PV system can independently power home and buildings. It can also be used in small remote solar systems that can power electric fences and traffic signs. Depending upon the season the photovoltaic systems will generate power from 8 am to 6 pm. A maximum output will be given around 1 pm in this condition. The PV modules are capable of generating electricity even when the weather is cloudy. However the output will be diminished. On an overcast day, a solar PV system receives only 5 to 10 percent of the usual amount of sunlight it needs and so the production is naturally diminished. Interestingly, Photovoltaic modules generate more power at lower temperatures as they operate more efficiently when the weather is cooler. However in winters, due to due to fewer daylight hours and lower sun angles the solar photovoltaic systems generate less energy than in the summer. If the system is designed, installed and maintained well, it can remain operative for more than 20 years. The basic PV modules, those are interconnected and enclosed panel of PV cells can function for more than 30 years. PV system generally requires direct access to the suns rays throughout the day. Hence a south-facing roof or roofs that face east or west will work best as sites for installing PV systems. Usually the small residential systems require 50 square feet of space whereas the large systems used for greater purpose could occupy as much as 1,000 square feet. So solar controller and solar inverter is relally important to complete a solar power system in such a way that all components deliver optimal results. Firstly, you must estimate your average power consumption, and try to build a solar power system that can cater to your needs, and even suffice up to a 30% increase in your current needs. solar panels is used to get sunlight, a solar controller is used to control and regulate charge and discharge, solar inverter is used to convert generated DC power into AC and feeding into the grid. A wide variety of solar panels are available in the market, the photovoltaic solar panels is and cheap efficientive, some panels come with a rail mounting system, while others don't; you can fix the solar panel to roof of your house using the same. Some folks believe that southwest-facing roof is the ideal direction, but I'd say that direction doesn't matter, so long as there's no shade on your roof. 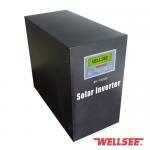 A solar power inverter converts solar energy into electric energy that you can utilize in your home. In the integration process, you need to connect each solar panel in series, but the problem is that you get DC power from the panels, while you require AC at home. Therefore, a power inverter needs to be connected to convert DC to AC power, and we're currently not considering the battery part, and assuming that you're using the grid supply alongside the solar power system. A real-time microcontroller sits in the middle of the inverter that controls very precise algorithms required for inverting DC voltage into AC. When installing, you'll have to run power from the inverter into the electrical service panel or the breaker box of your home, which will distribute the same to various electric loads through the existing household wiring. You may want to insert another box next to your service panel, so that it may be used as solar panel feed; adding a switch to it will allow you to shut it down as and when required. When there's bright sunlight and your power consumption is low, excess power produced by your solar power system will flow into the grid, causing your electricity meter to run backwards. 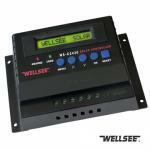 Welcome to contact wellsee solar, which will greatly improve your solar power system!